Description Maximize the surface of this Tee Off Full Color Process Suede Golf Towel to your advantage! This supersoft towel comes with a silver hook and grommet, deluxe black stitched trim, and beautiful full bleed full 4 color image of your logo or marketing message. 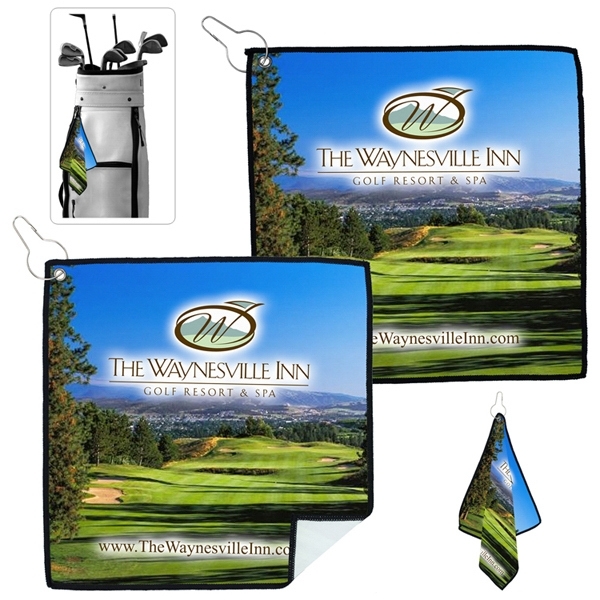 This soft suede-like towel is sure to enhance your next golf outing, charity event or countryclub promotion. Make sure your branding is seen all the way from the green by choosing this towel! Frontside - 80% polyester/20% nylon. 200 GSM. Backside - 97% polyester with 3% spandex. Size 12 " x 12 "
Price Includesup to a Full Color, Full Bleed Imprint on Front Only. Back is White as shown and cannot be printed.